We arrived at Cavan Baptist Church on Saturday, 21 October, in time to take part in Remix their Saturday youth event. 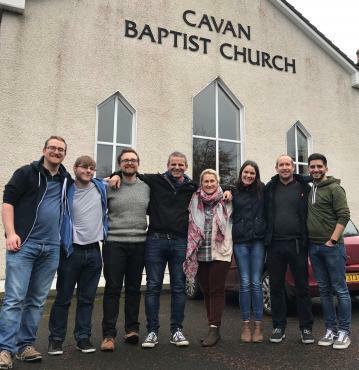 Next day, the Church held a fellowship lunch where the team were able to meet the congregation and get a feel for the vibrant, familial community that comprises Cavan Baptist. Our working week kicked off with a visit to Royal School, Cavan, where Martin Newell took the first of five assemblies in the week, (the team also assisted with the school’s lunchtime CU on Thursday). In the afternoon, we headed to the nearby town of Belturbet to go door-to-door, promoting a forthcoming Christianity Explored course and seeking gospel conversations with residents. Tuesday morning was the first of a number of sessions in a local school - Loreto College, giving a presentation on ‘What Baptists Believe’ to a range of age groups. On Wednesday evening team members led home group Bible studies across the county, based on the passages taught on Sunday. Charlotte McManus and Sharon Hoy, along with David and Chris, attended Crubany National School on Thursday morning, working with Jayne Gibson from CEF to teach a Bible story to the children. Later on the same day, a similar programme was presented to TNT, the church’s session for primary school children. Before heading home on Friday afternoon, we made a final visit to Royal School and to Belturbet.